Gerber Manufacturing has been manufacturing quality, heavy-duty site furnishings since 1969. The company specializes in steel picnic table frames in four strengths to suit any requirement. The tops and seats can be of wood, aluminum or recycled plastic. Four-foot to 12-foot lengths are standard. The frame finish is painted or hot-dipped galvanized. Other items manufactured include park benches, grills and bike racks. Gerber Manufacturing has gained wide acceptance in the park and recreation field for quality, price and service. Competitor Swim Products is now distributing the Titeline swimming lane tightener for creating optimal training and competition environments. Easy to install and operate, simply twist or untwist the Titeline adjuster in order to adjust the racing lane tension. Because Titeline does not twist the cable each time tension is adjusted, there is no wear and tear on the swimming lane cable. Titeline applies the proper amount of tension to the swimming lane without sacrificing the integrity of the lane. Constructed of durable, non-corrosive materials, the Titeline will not rust or crack. Available in four colors—blue, red, yellow and green—Titeline is resistive to sun and chlorine. From the "family that created an industry"TM over 40 years ago, SnapSports' products are some of the most advanced modular sports surfacing systems available. From its in-house engineering to its professional management team, SnapSports Inc. has plenty of hands-on experience. Backed by a 12-year warranty and great customer service, SnapSports' products are ideal for elementary schools, middle schools, high schools, colleges and universities, churches and city park and recreation centers. Many sports facilities choose SnapSports for budget, performance and customer support. Another state-of-the-art WMS Aquatics pool project is shown on the cover of the 2007 Commercial Aquatic Equipment Catalog. The catalog reflects the quality WMS Aquatics offers to customers that comes from years of experience supplying a complete line of equipment and supplies to the swimming pool industry. Call with aquatic questions and to receive a free 2007-08 catalog. WMS Aquatics is a GSA Federal Supply Schedule holder. Gold Medal announced the release of the new Sno-Bliz Sno-Kone® machine. Built by one of the industry's leading concession equipment manufacturers, this machine combines the best features available, including durability, power, ease of operation and safety. Built to last, this model will produce consistently perfect product over and over again. It features the power of a 1/3-hp motor in a lightweight and durable cabinet. Safe and simple to operate, even for a novice user, it is ideal for rental operations. The eye-catching design of the Sno-Bliz is perfect for countertop merchandising that is sure to draw attention and huge profits. Do you want to save money on chemicals and reduce your equipment maintenance? ECOmatic works in any application from the smallest, simplest system to the largest, most complex equipment rooms. Balboa Direct and ECOmatic have perfected this technology for over 30 years and have systems installed at some of the most prestigious properties around the world. ECOmatic saltwater systems reduce chloramines, which cause eye and skin irritation and unpleasant odors. It also breaks down contaminants such as sun products and body oils and with a higher hourly output than comparable models and a voltage regulator that ends worries about oversalting. 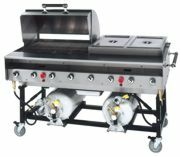 Belson Outdoors Inc., a leading manufacturer of commercial outdoor cooking equipment, introduced the PG-2460-S series barbecue grill. Its 24-inch-by-60-inch firebox is 100 percent #304 stainless steel, while its special folding leg assembly is made of durable powder-coated aluminum. The PG-2460-S is both C.S.A. design certified and NSF-approved. Designed for high-volume cooking and ease of transport, this unique, one-of-a-kind machine can fold to a height of 18 inches and be stacked four units high to save valuable space. Available in either Liquid Propane or Natural Gas models and sporting a complete array of accessories, the PG-2460-S with its 164,000 BTUs of searing heat is a choice grill for high-volume food service and rental operations.